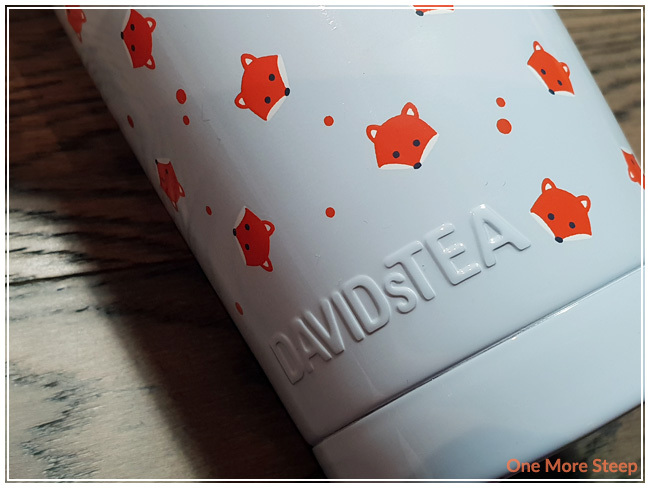 I picked up the Foxy Perfect Tumbler at my local DavidsTea because I saw the fox design and absolutely loved it. One of my current favourite stuffed animals is a giant fox that my boyfriend bought for me, so I just had to get the tumbler. DavidsTea has had these Perfect Tumblers for a while now, but this is my first one. The Perfect Tumbler is a double-walled stainless steel cup with a plastic lid that fits snug on top that opens and closes with a slide, which comes apart for easy cleaning with little clips. 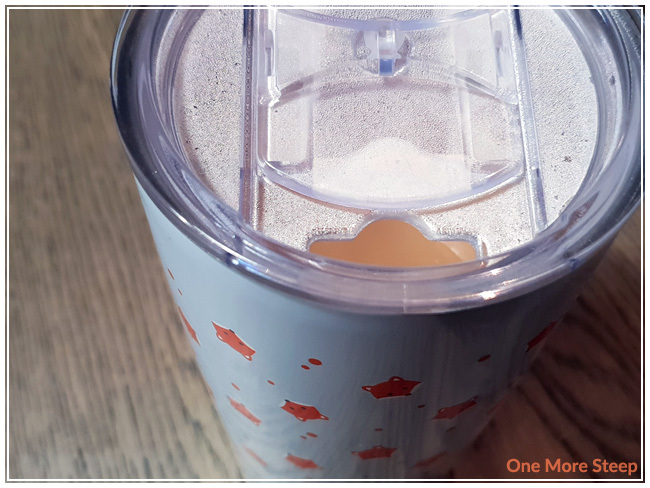 The drinking hole is large enough to put a stainless steel straw in, as the cup is designed for both use with hot and iced teas. The Perfect Tumbler is not dishwasher or microwave safe. While designed for people on the go (it fits into my car’s cup holders quite easily), it is not leak proof. I gave my Perfect Tumbler a wash by hand in warm, soapy water prior to my first use. I steeped tea directly in the Perfect Tumbler (for those curious, I made hot Hong Kong-style milk tea in it). The outside of the cup is cool to the touch, thanks to the double-walled design. The lid fits on easily and the slide works as expected – there’s a rubber bit that helps keep the slide from opening and closing by itself. Not exactly rocket science to figure out how to use it, and it does hold a very decent amount of tea. Because I had made hot tea in it, I set it aside with the lid on and found that my tea was still hot an hour later. 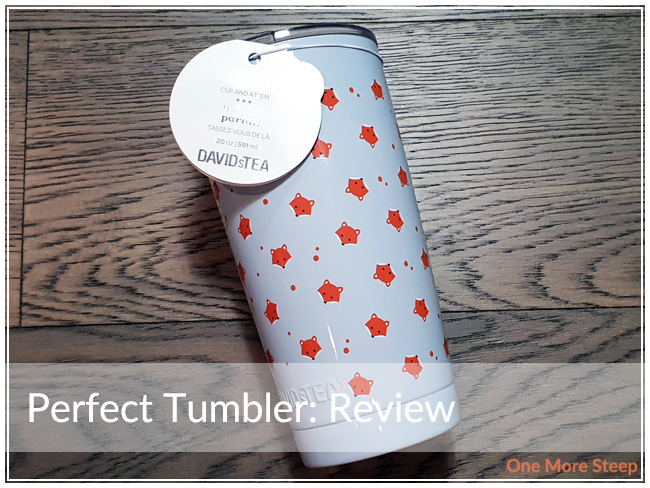 I loved DavidsTea’s Perfect Tumbler. I really like the Foxy design, and the overall shape and design of this mug. I can appreciate that it’s not leak proof, based on the design, but do think that some people might be turned off from buying it because of that. If you’re an office worker or want a cup for your home office, this might be a nice alternative to a regular old mug. I did read online that some people had issues with the finish on their Perfect Tumblers (either this one or other designs). I haven’t had any issues yet with the finish being scratched, but I’ve only used it a handful of times so far and it’s held up pretty well with being hand washed.